If you are looking to add a quality Shih Tzu Puppy for sale to your family, I would love to help you. 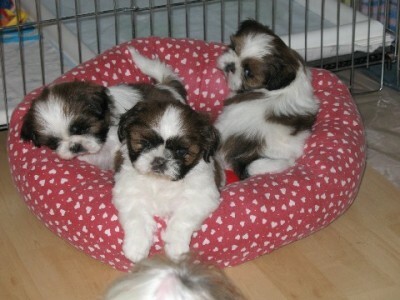 My Shih Tzu Puppies for sale are all raised in my house and are part of the family. All my Shih Tzu Puppies for sale and sold as pets come with a health guarantee, AKC limited registration a spay/neuter requirement and lifetime support from me, your Shih Tzu Puppy’s breeder. I do not sell dogs for breeding purposes. Because I am a certified positive reinforcement dog trainer my Shih Tzu Puppies get lots of behavioral training during each developmental stage as they are growing, beginning at birth. 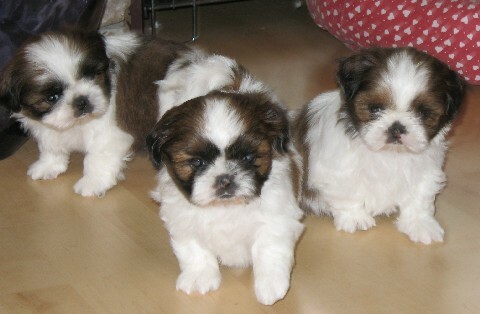 I occasionally have Shih Tzu puppies for sale available as show prospects, and I occasionally have a retired adult to place in a loving family home. 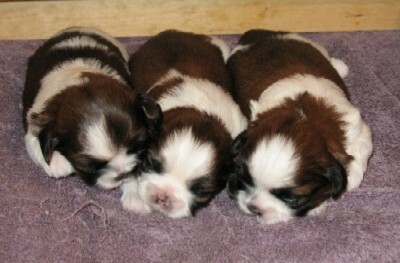 Why Should I Reserve a Shih Tzu Puppy? Families usually like to get Shih Tzu Puppies at a few weeks of age so they can enjoy each stage of the puppy’s development. The odds of my having a Shih Tzu Puppy of the perfect age just waiting for you to call me is slim, and as a reputable breeder, I don’t, nor could I, possibly do a responsible job breeding as many litters as would be required for this to be the case. That would make me a “puppy mill”. What age Does My Shih Tzu Puppy Need To Be? The recommendations of The American Shih Tzu Club is 12 weeks of age. I will however, if the individual puppy is emotionally mature enough, allow it to leave a week or two sooner, depending on the situation. I find that many are ready by 10 weeks of age. Shih Tzu Puppies taken from the mommy too young often display fear behaviors because, while they may not need mommy to nurse for nutritional reasons, they need her for emotional ones as well as to teach them how to be a dog, have dog manners and know doggy etiquette. Furthermore, the Shih Tzu Puppy’s bonding period is not until between 9-12 weeks of age, so you won’t miss having your puppy bond with you. 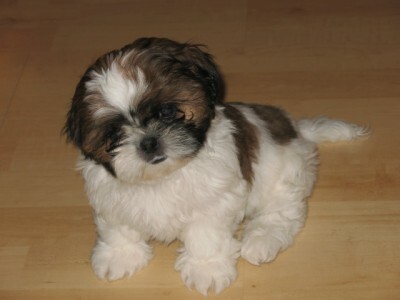 Will my Shih Tzu Puppy be Wormed and Vaccinated? Yes, your Shih Tzu Puppy will have had 2 separate wormings with Pryantel for roundworms and homeopathics nosodes for Parvo, Distemper, Influenza, and Kennel Cough. Please see the following information on Vaccinations and notice the studies done by the vaccine companies themselves on the effectiveness of early vaccines. This article will explain why I will not have given your puppy his/her vaccination puppyshots, at such a young age, before your puppy is ready for you to take home, and I hope will also help alleviate your concerns about this. Let me repeat again that the puppy will have been given homeopathics, which are extremely effective, for these diseases to help protect your puppy until he/she is old enough to recieve a vaccine injection. 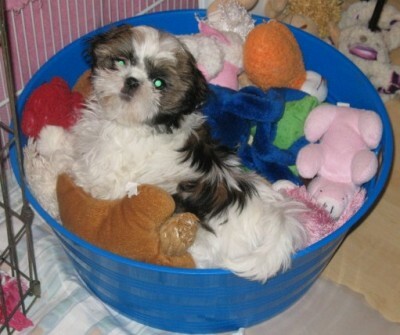 What Does My Shih Tzu Puppy Come With? Your Shih Tzu puppy will come with a new baby blanket that smells like mommy and a new toy that smells like its siblings. It will also have a chew bone, some food, samples of supplements I recommend and a Shih Tzu Puppy packet of helpful information and training tips along with your registration papers, the sales contract/ health guarantee and the spay/neuter agreement. What Type of Development Work is Done With My Shih Tzu Puppy? Your Shih Tzu Puppy will be exposed to many different types of sounds including thunderstorms, rain, children playing and other dogs barking, all sorts of textures, materials, different footings, and a variety of play objects. House training is started; tho they are too young to have control, they will have a clear separation of play, sleep and potty areas. They will have experienced wearing a collar and dragging a leash, start to learn to come and to follow, not to jump up or bark for attention, be polite when being petted, an introduction to being bathed and groomed, and be comfortable with being handled. They will also be exposed to group play with adult dogs of various ages and sizes and will have a good start in learning how to speak “dog”. What Does Lifetime Support Mean? It means that I, your Shih Tzu Puppy’s breeder, am available for you to call with questions, for advice, information, with concerns, etc. If, for any reason, you are ever unable to keep this Shih Tzu puppy, regardless of its age, I will take it back and help find it a new loving home. I feel that I, the breeder, have chosen to bring this Shih Tzu puppy into the world and as the breeder I am obligated to do all I can to ensure the best possible future for this dog, both in my house and your’s, for the life of this dog. Why Should I Fill Out a Questionair? As a reputable breeder, I have brought this Shih Tzu puppy into the world. It has no say as to its future. I am the only voice it has to ensure that it is placed in a secure, loving environment. All Shih Tzu Puppies for sale are precious to me, and I do everything I can to ensure that they all have a happy, healthy life. To this end, I carefully screen anyone interested in one of my dogs. *What if there is a behavior you don’t understand, or a situation you are not sure how best to handle… are they going to be there for you, or are they simply taking your money and wishing you and your new baby a happy life, as if it is of no concern to them. If they are not available for you,you might wonder “why not”; do they have the knowledge and expertise to answer your questions and concerns? Please open Shih Tzu quesionaire and fill out and return if you are interested in a Sapphire Shih Tzu puppy.